Learning how to be a better singer takes time, practice and patience – but the simple approach I’m about to share with you is going to shave half the time off the usual learning curve faced by singers looking to become a better singer. Singing itself is a very simple process of pressure, resonance and vibration – but the many conflicting and confusing vocal methods out there often muddy the waters and make it much more frustrating process that it needs to be. Let’s take a look at the usual learning curve that many singers face while using common vocal methods like many contemporary courses and singing methods. Stage 1 is often a very exciting stage for beginner singers, and with the basics alone like breathing and resonance, you seem make a small amount of progress which is super cool and exhilarating! Unfortunately, this progress is short lived for many singers as they approach the Stage Two Rut, where every step forward seems to take you five steps backwards in the other direction. Sadly, many singers who use contemporary singing courses and vocal methods get stuck in the Stage Two Rut, and out of frustration and desperation branch out into other approaches and buy more courses and buy more lessons – finding themselves right back at Stage 1 learning the basics over and over again until surprise, surprise, they end up right back in the Stage Two Rut again using each different vocal method. For a select few singers who, let’s face it, were probably naturally talented singers to begin with, there’s also Stage 3 where singing becomes a true joy, punctuated by an extensive vocal range, a killer tone and the ability to sing any song you’ve ever dreamed of. If you’re stuck in the Stage 2 rut, or you’re not sure how to get started – It’s going to be okay though, because there’s finally light at the end of the tunnel! As you can see, this isn’t a very effective way to learn how to sing, and it’s definitely not an efficient learning curve. So instead of following this generic path to vocal frustration, let’s forge a new learning curve using the Foundation, Growth and Balance approach that I’ve developed with 20 years singing experience and over a decade of professional coaching expertise under my belt. By replacing Stage 1, Stage 2 and Stage 3 with Foundation, Growth and Balance instead, you’ll see the learning curve becomes much more practical and proportional between the amount of time, effort and training you invest in your voice with the ongoing progress that you enjoy. The Foundation stage in this powerful vocal approach is where you develop a relationship with each individual element of the voice, from Vocal Onsets right through to increasing range and creating efficient resonance. 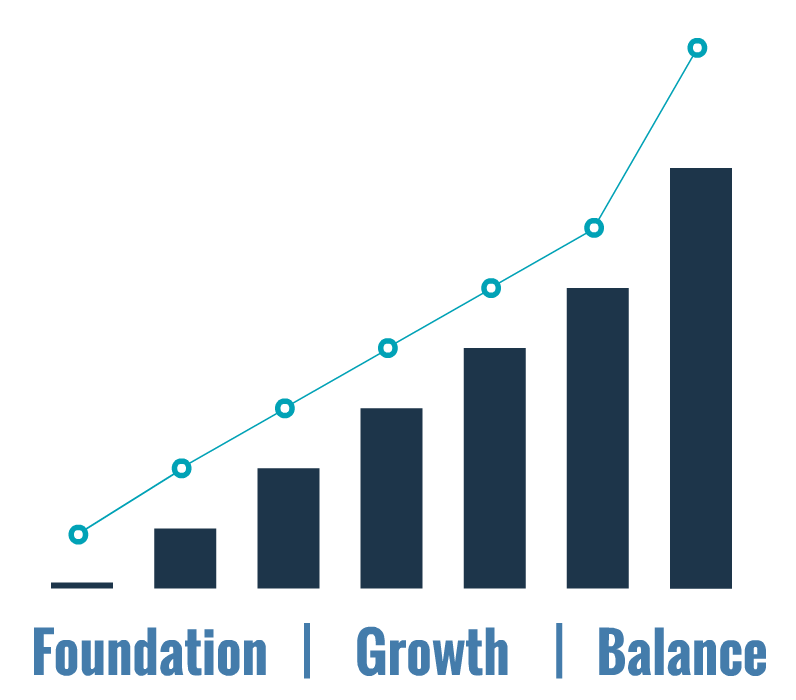 The Growth Stage is where you build strength in each element while increasing range and improving your vocal tone – this lead you directly into the final Balance stage of singing, which unlike the magical Stage 3 part of the original curve, is available to ANY singer who puts in the time, effort and invests in this powerful process of Foundation, Growth and Balance in their voice. A great place to start is the Exclusive Foundation Singing Lesson which will show you how to make the most out of this powerful process. By setting up a rock-solid Foundation, you will ensure that you see ongoing progress in a tangible way that is proportionate to how you’ve invested in your voice with ongoing training and practice. Foundation for singing really is very similar to the Foundation of a house that is being built – the rock solid concrete base that your range (walls) and tone (roof) are being built upon. If you skip over the foundation, your voice will crumble just like a poorly built house! I recently bought your course and can feel the resonance, super cool! If you’re ready to start the process of developing a powerful and consistent singing voice, you can get started right now by purchasing the Foundation 101 singing course to learn how to sing with balanced onsets, support, shaped vowels, resonant space, increased range, improved tone and SO much more!